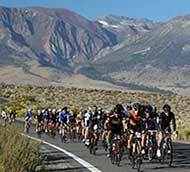 Bicycling Nevada - September 2018 The Bicycling in Nevada calendar for September is busy from beginning to end with challenging and enjoyable events on trails and highways all across the Nevada map. 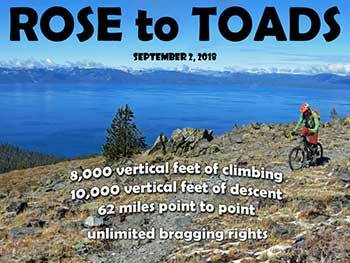 The Bicycling in Nevada calendar for September is a busy one, with lots of activities starting with the Tahoe Area Mountain Biking Association’s (TAMBA), 8th Annual “Rose to Toads” on September 2. This is 8,000 vertical feet of climbing. 10,000 vertical feet of descent covering 62 miles from start to finish. 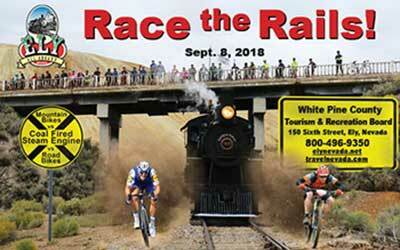 On Saturday, September 8 Ely will host the 2nd Annual “Race the Rails“ at the Nevada Northern Railway. This is a race between Mountain Bikes vs Road Bikes vs a coal-fired 19th century steam locomotive. At the sound of the train whistle, mountain bikers and road bikers race onto their individual courses to see who can get back to the depot before the train. The bicycles race against one of history’s most powerful Inventions! Also on September 8 is the Mammoth Gran Fondo, 102, 70 & 42 Mile Route Options with timed results. 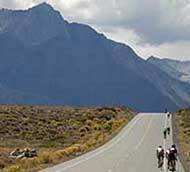 This ride benefits the Mammoth Mountain Community Foundation and started at the High Sierra Fall Century. Bicycles in Wilderness — Yes/No? There’s been some grumbling about how some of the more recent inventions make modern life too easy, but over time those tools and technologies have become accepted parts of our adventures in even the most remote places. But along came the human-powered mountain bike, and some people now consider them to be so high-tech they should be banned from wild landscapes. I shouldn’t be writing this, and you shouldn’t be reading it. But a vocal minority is drudging up the long-resolved question of mountain biking in wilderness. They have even drafted a bill for that would open wilderness to biking. That means we have to pause and rehash the facts. There are 75 miles of the Gran Fondo route closed to through traffic and is fully supported with Aid Stations and after ride party with food & entertainment. 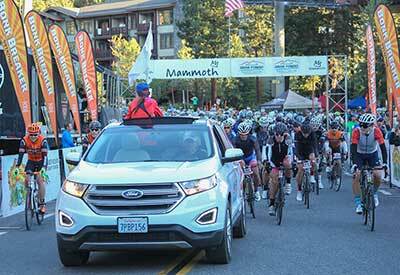 The 16th Annual Tour de Tahoe – Bike Big Blue ride comes up on Sunday, September 9. Produced by your author and Bike the West, this is our second ride around Lake Tahoe. 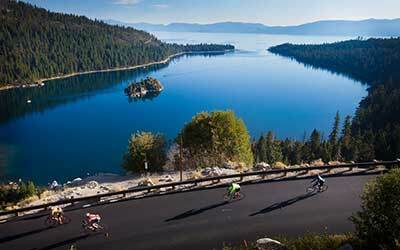 A Must Ride for any recreational bicyclists, Tour de Tahoe is a fully supported bike tour and includes rest stops stocked with food & beverage, medical support, mechanical support, SAG transport services, and more starting and finishing from the Hard Rock Hotel & Casino at Stateline. Participants also enjoy an after ride Pool Party with a meal and entertainment at the Hard Rock Pool. Another event in September that utilizes “America’s Loneliest Road”, US Highway 50, is the Silver State 508, set for September 14-16. A 48-Hour endurance race from Reno to Eureka and back. This for solo individual participants as well as 2 and 4-person relay teams, tandems and 2-person 50/50 relay teams. This race covers 508.8 miles and 22,574 vertical feet of gain and loss (details here) and is not for the faint of heart but a challenging race into the midst of the Great Basin with the course riding through Virginia City, Dayton, Silver Springs, Fallon, Middlegate, Highway 722, Austin and Eureka. 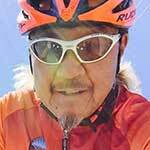 The Silver State 508 is also a qualifier for “RAAM” Race Across America, a 3000-mile bicycle race from Oceanside, California to Annapolis Maryland, in June of 2019. ﻿﻿ Happening the same weekend, on Sunday, September 16 is the Edible Pedal 100, presented by the Reno Sunrise Rotary Club. This annual event starts and finishes at Bowers Mansion Regional Park in Washoe Valley and offers a variety of ride distances from a 10-mile children ride, 32, 54, 74 and 150K distances and is fully supported with fresh, seasonal, local bounty at rest stops and post ride Barbecue. If that’s not all, Interbike is coming to Reno-Tahoe, September 14-20 with yet more activities for bicycling enthusiasts. This is the largest Annual gathering of the bicycle industry in North America with more than 800 companies representing nearly 1000 brands at the Interbike Expo. 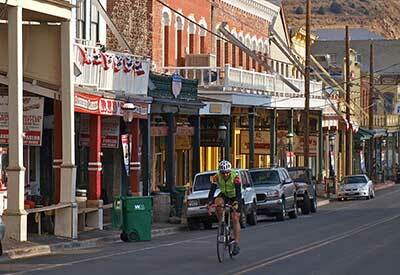 Austin Nevada is the mountain bike town that could be. 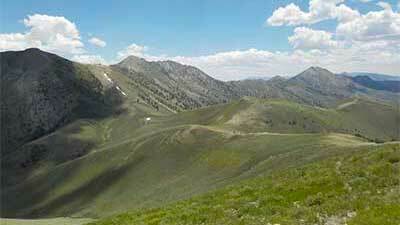 It boasts a variety of trails right out of town and is nestled in the Toiyabe Range off US Highway 50, the loneliest road in America. There are a variety of campgrounds, historic points of interest, hot springs, and other attractions to bring you to the middle of Nevada. Are you loading up the car yet? This Expo is for bicycle industry representatives but there is also a Consumer Demo and Northstar Freeride Festival held September 14-16, and an Outdoor Retail Demo, September 16-17, also held at Northstar Resort in Truckee. An opportunity to test ride the latest technology from a variety of manufacturers. The actual Interbike Expo for bicycle industry people is held in the Reno-Sparks Convention Center Tuesday – Thursday, September 18-20. There are a variety of activities and events include IBD Summit with educational and marketing presentations and seminars. 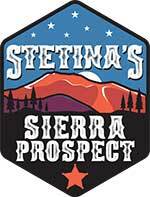 A bicycling ride event open to the public in conjunction with Interbike is Stetina’s Sierra Project road bike event culminating with a ride on Sunday, September 16, the same day as Edible Pedal 100, and utilizing some of the same course routes. This 44-Mile, 5600 vertical feet ride and 78-Mile, 8200 vertical feet ride ride will also benefit the High Fives Foundation. 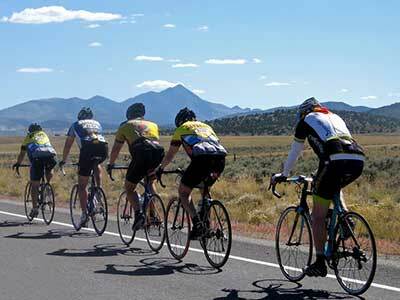 The 27th Annual OATBRAN – “One Awesome Tour Bike Ride Across Nevada” is slated for September 23 – 29 and continues to take riders from all over the country across Nevada on US Highway 50. “America’s Loneliest Road”. This event started with a grant from the Pony Express Territory of the Nevada Commission on Tourism and was to highlight the Loneliest Road as a great bike route across the state and introduce visiting bicyclists to the communities of Stateline Lake Tahoe, Fallon, Austin, Eureka, Ely and Baker. it started as a camping style tour, but is now a fully supported motel style tour, complete with overnight accommodations, gear transport, rest stops every 20 miles, all meals provided by various non-profit groups in each community and culminate with a special tour of the Lehman Caves at Great Basin National Park. There is no lack of bicycling activities in September, so get out and enjoy the best time of year to be on the saddle. Be Safe & Ride On! Does anyone offer a ride similar to the old OATBRAN Tour that is van supported with camping as opposed to motels? There is no other organized bike ride across Nevada. There are a few across US tours that ride across Nevada, mostly using the I-80 corridor . . . not sure if they camp or use motels. In early years of Oatbran, it was a camping tour, with options for riders to purchase their own motels, if they wanted. But after 9-11 we lost the Armory in Ely and had more folks looking to stay in motels instead of camp and it was too challenging to drop some riders at camp ground and then deliver people and luggage to a variety of motels in each town. So, we decided to change to Motels and and unload in one place.